Andrew Gilligan accuses “the cycle lobby” of thinking only of themselves and not “putting themselves in the heads” of non-cyclists. In-fact, failure to think as a non-cyclist is exactly why the policies of Boris Johnson are such failures. Kulveer Ranger, said: “Cycle Superhighways form a key part of the Mayor and TfL’s target to increase cycling in London by 400 per cent by 2025, compared to 2000 levels. From cycling the proposed routes myself, and speaking to a whole range of cyclists, I’m sure that these routes will prove a hugely welcome addition to London’s cycling infrastructure – giving many more people the confidence to ride”. But this hyperbole soon backfired on Boris when it turned out that the Superficial Cycleways were, except for sections of existing dedicated infrastructure taken over on CS3, little more than £100 million paint on the road — paint that dances and dodges around petrol power, does nothing to transform the experience of cycling on the capital’s busy arterial roads, and does nothing to boost the confidence of the would-be and wanna-be cyclists that Boris claimed would be attracted by the novel hued bike lanes. Although TfL have been able to claim that there has been a large increase in bike traffic on the Superhighways, they don’t really appear to be doing much to enable or encourage non-cyclists: at most, some existing cyclists have been tempted out of the backstreets and onto the main roads; few new cyclists have been created. The most common question Londoners have about the Superhighways is: are they joke? 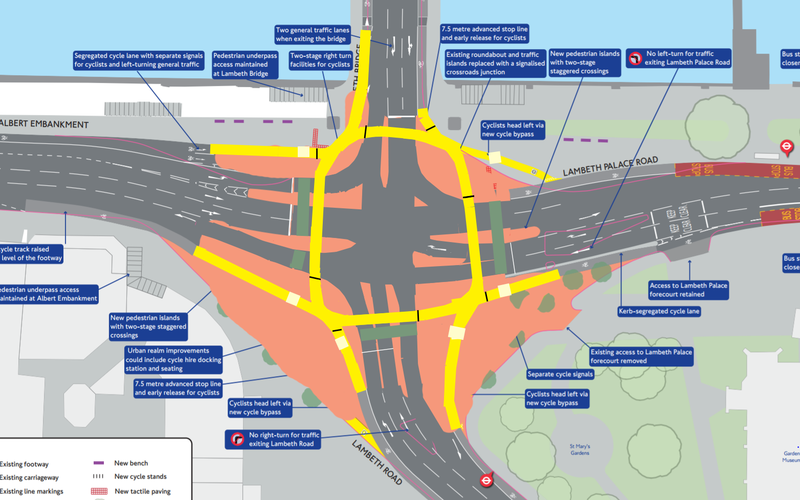 Since people started dying on his Superhighway at the Bow junction on the East Cross Motorway, Boris has taken the emphasis off the dozen radial routes which were once “central” to his cycling revolution, and when he does talk about them these days he will tell you that the blue paint is a navigational aid — no mention of excluding “petrol power”, boosting safety, or transforming experience. What were originally sold as part of a cycling revolution which would enable and encourage people to take to their bikes have turned out to be, at best, something to help existing cyclists find their way to the square mile. Go Dutch, and The Big Ride, are precisely the product of the London Cycling Campaign “putting themselves in the heads of non-cyclists”, and calling for streets to be arranged for the 98 per cent who currently would never dare to cycle on them. The Go Dutch campaign was squarely pitched at the non-cyclist, showing everybody how, with a determined leader, London’s busy roads could be transformed into places where anybody and everybody can use a bicycle, and share in all the benefits that come with cycling. Gilligan seems to think that the campaign and ride was a demand by existing cyclists that they must be pampered and privileged in their niche activity. Far from it. The point that The Big Ride made was that the “cycling revolution” that Boris Johnson promised will not be delivered so long as he continues designing cycling policies and “Superhighways” for the 2 per cent who already cycle. Indeed, many of those who rode with us on Saturday are, on any normal weekday, part of the 98% themselves. As part of the two per cent willing to — no, no, as part of the one per cent happy to — cycle on the streets of London as they are, Boris is the last person who should be appointed to lead a “cycling revolution” aimed at enabling the 98 who don’t cycle to take it up. He boasts that “scooting down Euston underpass” and around Hyde Park Corner are “no problem” when you’re “used to it”, and his now infamous comments about the Elephant and Castle being “fine if you keep your wits about you” tell you everything about how far he has penetrated the minds of ordinary non-cycling folk. Boris’s “cycling revolution” seems to be designed around the premise that there is a large population of Londoners who are just on the cusp of taking up cycling and who just need lessons in “keeping their wits about them”, or blue paint and hire bikes to help them to “get used to it”. Boris understands how his 2% cycle so he designs policies for more of it. But the conclusion of last year’s Understanding Walking and Cycling project (admittedly primarily based on research in England outside of London) was that there is no such substantial section of the population just waiting to take up cycling in traffic, ready to be nudged in by one cheap and simple little thing. The Understanding Walking and Cycling project — which has informed and given urgency to infrastructure campaigns like Go Dutch — “put themselves in the heads of non-cyclists” and found that the 98% will not cycle so long as they expected to keep their wits about them and get used to the Euston underpass. There are very few waiting to join the 2% cycling in heavy and fast traffic: if you want a cycling revolution, you have to try something new and different. The 98% look at the policies of the Cycling Mayor and see irrelevant “Superhighways” which they presume must be good for Cyclists but on which they would never dare to cycle themselves. They look at Go Dutch and see civilised dedicated space on which they might. And Gilligoon thinks it’s the latter who are out of touch and appealing to the minority on cycling. Boris even came close to showing signs of understanding all this when he talked of not having to “dance and dodge around petrol power”. But like so much about Boris, that turned out to be all waffle and no substance. The problem with Boris and his cycling revolution, and the many reasons why he has messed it up on cycling, obviously go far far wider and deeper than his inability, as a contented member of the 2%, to understand why the 98% are so reluctant to join him. But I’m not sure I can bring myself to write about, or even think about, it any more. Please, just make it stop. This is part of a series gathering thoughts on what is wrong with London’s road junctions. The bus station is on the northbound side of Waterloo Road, and the northbound section of the roundabout is, perhaps uniquely, split in two, both in space and time: the buses exiting the bus station have their own phase of the lights, and their own dedicated carriageway for this quarter of the roundabout. In amongst the sprawling traffic traffic lanes and bustling bus station, a few scraps of stop-start “cycle facility” are provided. Heading north on a bicycle on Waterloo Road, when past the left-turn into the bus station, one is given the option of a tight-left turn into a narrow fully segregated unidirectional cycle track (best illustrated by this architect’s drawing of a hypothetical bus shelter). There is no such cycle track for bicycle users entering the roundabout from any of the other arms, but they are provided with a way into this cycle track once they have negotiated the roundabout all the way past the Waterloo Road arm. Except that by then the cycle track has already run out and instead become, for the final few yards, an on-street cycle lane, within the bus station, on the right-hand side of the buses. That leads you up to the advance stop box and the traffic lights in this video. I can’t think of any reason why anybody would use this facility, except out of cautious lack of familiarity with the road, in the mistaken belief that a cycle track will safely lead them to where they need to go. The timing of traffic lights on the roundabout and on Waterloo Road are such that if you chose to use the facility then the traffic lights for the exit from the bus station will almost always be turning red a few seconds before you reach them, and if they’re not, well, that’s even worse — you’re deposited in a narrow and soon to expire lane on the wrong side of a line of buses all racing to get through the short cycle of the lights. And see how they race! In fact I observed a few rounds of the lights before I erected the conspicuous camera and tripod, and I’m sure the drivers must have noticed when they were being filmed, for, before the camera was set up, on every single round of the lights a bus would crawl all the way to the front of the advance stop box and the drivers, clearly intimate with the signal timings and watching the behaviour of the neighbouring traffic streams, were experts in setting off a full second before their own light turned green — every time. You wouldn’t want to be the on a bicycle directed up the narrow lane on the right-hand side of those. There are several fundamental problems with the ideas behind this junction. One is that it’s good to put bicycles and buses together. British engineers are told by the DfT’s cycle infrastructure guidelines that cyclists like sharing with buses and so engineers should plan them into the bus spaces. But to say that cyclists like sharing with buses is either a misinterpretation or misrepresentation of the research — a survey which found that existing cyclists preferred lanes where they only had to deal with buses over general traffic lanes where they had to deal with buses and fast cars and big trucks. (The same survey also found that cyclists and bus drivers have a low opinion of one another.) Bus lanes are less awful than no bus lanes; that doesn’t mean that most people like riding bicycles in them or that they can bring about mass cycling, and it certainly doesn’t mean that a bus station, where a lot of buses are stopping, waiting, and pulling in and out of tight spaces, is a safe, sensible or attractive cycle route. But the most fundamental issue is perhaps that both the cycle facility and the bus station is weird cheap improvised one-of-a-kind crap stuffed in where it won’t get in the way of the very important people who drive cars and hire cabs in central London. The de facto hierarchy and prioritisation of motorised modes is a familiar problem, to the point that it is barely interesting when considering this junction. Rather, it’s the cheap improvisation that makes this one stand out. These weird ad lib facilities, which stop-and-start, merge and diverge, and abandon you in unexpected places, apart from being unattractive and unlikely to be much help in bringing about mass cycling, make everybody’s behaviour unpredictable, and that leads to mistakes being made. Certain British cyclists look at the Netherlands, see it all working smoothly, and conclude that the laws must be beating everybody into good behaviour — the fear of insurance claims under “strict liability”, perhaps. 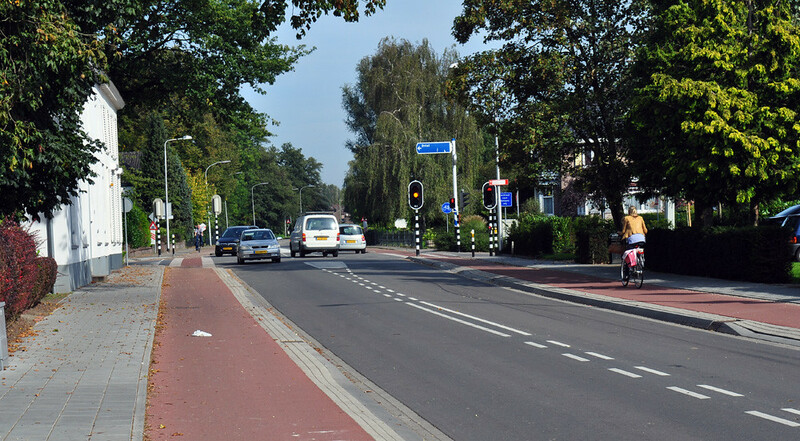 But they’re overlooking the many ways that the Dutch control behaviour through engineering — not merely physically preventing bad behaviour by designing out speed, but also engineering out mistakes by making things obvious and predictable. Roads are built differently to streets and lanes, for example, and it is therefore obvious which you’re on and what is expected of you. Roundabouts in particular are made to be predictable places: there are few designs, with minor variations between them. People on bicycles get their own dedicated space, everybody understands that this is so, and it is made very obvious where bicycles and motor vehicles could come into conflict and which gets priority in those places. British roundabouts follow no such rules. Some of them are a single lane, some of them two, three, four, or even five or six, depending on how much space the engineers had to play with. Sometimes there are lane markings, sometimes these are concentric circles that you veer across as you proceed, sometimes they spiral around to carry you all the way to your exit, and sometimes lane markings come and go several times in the course of your gyration. Sometimes there are traffic signals on the roundabout, sometimes there are traffic signals only on the entrances, and sometimes a roundabout will have a mix of signalised and non-signalised segments and entries. Sometimes there are signalised pedestrian crossings, sometimes there are informal traffic-island crossings, sometimes there are zebra crossings set back by the statutory distance, sometimes there are underpasses, and sometimes there is nothing and nowhere for people on foot. The huge variety comes from the obsession with eking out every last drip of traffic flow capacity at the expense of safe and intelligible standardised layouts. And the result is confusing and stressful enough for users, even without their having to worry about what sort of bizarre ad hoc cycle facility hack has been woven around the edges. If you want people to ride bicycles where there are big, fast, complicated roads like this, you need a cycle track, but a proper one, put in the right places, continuous and predictable. Under Ken Livingstone, when street space was still being reclaimed in the post-CCharge introduction period, a new design for the IMAX roundabout was proposed. There was one of those world-of-their-own architect’s mockups, big on shared space, which imagines that a stone surface makes trucks disappear and leaves a big plaza full of happy pedestrians (and, even more bizarrely, imagines a totally new IMAX building). South Bank organisations are still promoting the plans (passively, at least, through a website last updated two years ago), but there can’t be any chance of anything changing here with Boris in city hall. Do you have any observations of the Waterloo junction to add to the Tour du Danger dodgy junctions dossier? 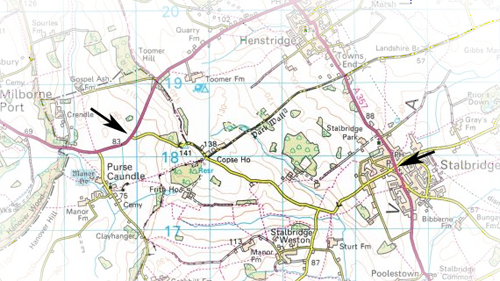 This post is part of a series, starting at “So what would you do here?” and On rural main roads, on making cycling an attractive mode of transport in rural Britain. Big busy fast main roads are the major barrier to making journeys by bicycle for most of the rural British population, and proper high-quality cycle tracks are the most plausible solution to that problem. It would be nice to be able to reclaim all the roads from the fast cars and big trucks, make them places where people can happily ride bicycles again, but that doesn’t seem likely for a long time. At the moment, providing dedicated inviting space for bicycles alongside them is the only proven solution. 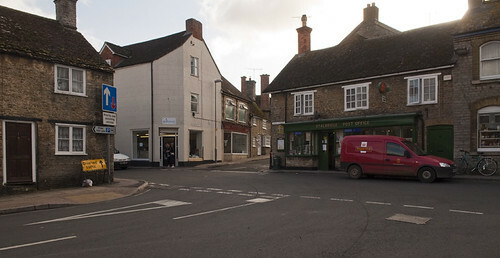 But more often the reverse is true of rural villages. Not only is it difficult to provide cycling space because of the constraints of very old streets, but the political will is the opposite within villages than without: speed is unpopular and most residents want the cars tamed and the streets reclaimed for people. It is just about possible to calm these streets, with the right engineering, and the will to do it exists — not because of anything to do with cycling, but because people live and work and shop and raise their kids in these places. That’s part of the Dutch model, where they recognise that roads, whether we like it or not, have become routes for motor vehicles, while streets must be places for people but where, with the right engineering, a limited number of motor vehicles can be accommodated.